Up, Up and Away! Stratosphere Las Vegas | ScottyVegas! Have you ever been to the Stratosphere? You know, that tall needle like structure way north on the strip? Funny how most people I talk to say they’ve never been there. Yet the Stratosphere seems to always be in the background of every Las Vegas ad you see. The problem with the Stratosphere is that nothing is close to it and it takes effort to get there. But if you’ve never been there before maybe you should consider it, why, you ask? Well if anything else it has several unique attractions that no other hotel in Vegas has. The first and most obvious is that it is the tallest building in Las Vegas and offers spectacular views of the whole city and the surrounding mountains. The amount of Air traffic in the Las Vegas air space is unreal. Blimps, helicopters, and planes are everywhere all day, every day. It’s a neat experience to be at level with a flying blimp or helicopter. 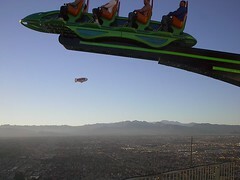 If that isn’t enough in itself the top of the Stratosphere is home to three record breaking thrill rides. X-Scream – Is like a giant teeter-totter 866 feet above ground and 27 feet over the edge! Insanity – Will spin you at a 70 degree angle 64 feet over the edge at up to 3G’s! Big Shot – Shoot’s you up 160 feet at 45 mph to a total height of 1081 feet above ground! As you would imagine there is also a restaurant at the top of the tower that revolves 360 degrees. Though I’ve heard mixed reviews regarding food quality the view/experience gets thumbs up. I’ve only been to the Stratosphere once back in 01/2005 and I really don’t remember too much about the casino floor but do recall having to go through a cheesy “mall” like area before getting to the elevators that takes you to the observation decks. The shops in the “mall” area were not very appealing, flee market type stuff. I also recall the whole place being kind of a dirty dump. But don’t let this stop you. If you’re feeling adventurous to experience Vegas a little different, consider visiting the Stratosphere because the rides and observations decks won’t disappoint! Interesting fact: Since its opening in 1996, five people have jumped to their deaths from the top of the tower.